Carpal tunnel syndrome is a condition in which the squeezing or compressing of a nerve that passes through the wrist results in numbness, tingling, weakness, or pain in one or both hands. The hands may become so weakened that opening jars or grasping objects becomes difficult and painful. The carpal tunnel is a space formed by the carpal (wrist) bones and the carpal ligament (a connective tissue that attaches bone to bone). Through this space pass the median nerve and tendons of the fingers and thumb. (The median nerve runs from the neck through the middle of the arm to the fingers. Tendons are connective tissue that attach muscle to bone.) When the tendons within the carpal tunnel become inflamed, they swell and press on the median nerve. A number of conditions can cause swelling of the carpal tunnel, leading to pressure on the median nerve. Such conditions include pregnancy, arthritis (inflammation of the joints), hypothyroidism (reduced function of the thyroid, a gland located in the neck that plays an important role in metabolism, or the conversion of food to energy), diabetes (an inability to metabolize—or break down—sugar properly), menopause (the point in a woman's life when menstruation ceases and childbearing is no longer possible), and pituitary abnormalities. (The pituitary or master gland secretes substances that directly or indirectly influence most basic bodily functions). Also, performing a job that requires repeated bending or twisting of the wrists increases the likelihood of developing the disorder. 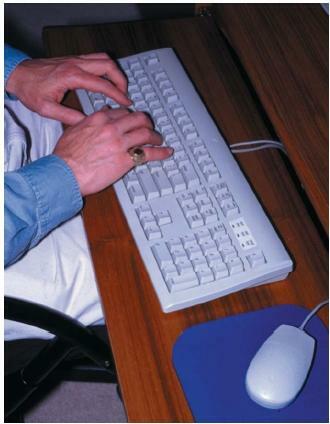 Continuous flexing of the wrist, as when typing on a keyboard or playing a piano, can cause compression of the median nerve. Carpal tunnel syndrome is much more common among women than men. Carpal tunnel syndrome is treated initially by applying a brace, or splint, to prevent the wrist from bending and to relieve pressure on the median nerve. If a person's job is causing the disorder, performing other work may be necessary. Treatment of a related medical condition may relieve the symptoms of carpal tunnel syndrome. Severe cases may require surgery to decrease compression of the median nerve.